Northwestern County of the State. It was organized June 8, 1753, from a portion of Morris County. During French and Indian Wars the settlements on the upper Delaware were subject to Indian incursions. In November, 1755, Colonel John Ruderson, with the Sussex Militia, sent to the Moravian Missionaries at Bethlehem for powder and was refused, but the powder was later furnished on threat to burn the town. When the Indians destroyed Gnadenhutten in Pennsylvania, the Sussex Militia went to assist the people of the back settlements and forts were built at Broadheads, Colverts Mills, and other places for defence of Sussex County. In May, 1756, the Indians appeared in Paulis Kill, Sussex County, and the Colony denounced the Lenni-Lenape as enemies, rebels, and traitors because of treaty violation. In the pre-Revolution days the Sussex delegates to Colonial Congress opposed the resolutions relative to Governor William Franklin July 16, 1774. The freeholders of Sussex County met at Newton and adopted resolutions expressing allegiance to the Crown and urging the repeal of the Boston Port Bill and offering to become parties to redress the grievances of the Colonies. Early in the struggle, a Tory Association was organized in Sussex County, the members of which resolved not to pay the taxes levied by the Province or to attend militia musters. In August, 1776, it was reported to Congress that a search for lead mines in Sussex County had disclosed "Symptoms thereof" about four miles from Newton and flints "exceeding promising" near Beaver Run, Sussex County. "The Farmers Journal and Newton Advertiser" was published in Sussex County 1796-98 by Elliot Hopkins and William Houston. In Sussex, the slave population in 1790, was one forty-fifth. In 1820 the County was the most populous in the State. Zinc, lead and other minerals of commercial importance are found in the County. County Seat. Sixty-eight miles from Trenton. Court House here authorized by Act of 1761. Two miles south of Newton in region of Big and Little Muckshaw is Moody's Rock. Site of hiding place of Bonnell Moody, a noted Tory, and his followers. Tradition says that Moody was captured in the American Ranks near Morristown and hung as a spy. Six miles north of Franklin, 12 miles north-east of Newton. Monument near Lawrence Homestead marking encamp- ment of Washington's Army on March from Newburg to Morristown. Monument erected by Marquise Ellen Kays McLaughlin, a member of the Chinkchewanska Chapter, D.A.R. Named from Swartwout, an officer in British Colonial Service obnoxious to the Indians because of his activities. Scene of Indian Massacre in which Swartwout was slain. Constructed by the Dutch, who oper ated the mines about 1650. In Sussex County, at Port Jervis, it passes through a brick house and the village of Minnisink, parallel to the Delaware River. It begins at Kingston, New York. Minnisink was the scene of Battle of Minnisink, July, 1781, with the Indians, commanded by Brant. West, brook House or Fort. 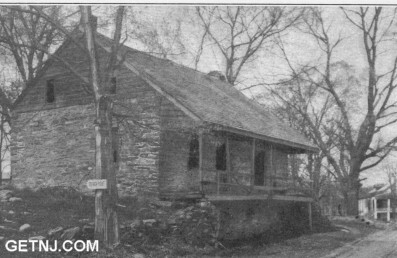 Oldest house in Sussex County. Family living in Minnisink as early as 1701. Van Campen Inn. Stopping place of John Adams, second President of the United States.